Clearly bothered by the recent exclusion of Pluto as a planet, my co-worker put up a sign of protest at his cubicle. "I grew up with nine planets, I want to die with nine planets," said an upset Jordan Everhart Friday afternoon. 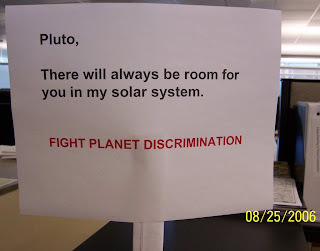 "Dude, there will always be Pluto," he said.